Walmart Marketplace requires different attributes on the products, depending on their category. Click the Manage Attributes link. If the product has no Walmart Parent Category and Child Category set, you must select these first; read more about Walmart categories. The list of attributes will now appear. Not all are required, and they vary based on the category. Go to Inventory > Import Product Info > Import Walmart Marketplace Attributes. Click Download Template. See the description of the template headers, below. Populate the template with Category Name, Attribute Name, and Value (expected values are alphanumeric). Category is required because attributes are category-specific; read more about Walmart categories. After saving the template, click Choose File > Upload Attributes to import. 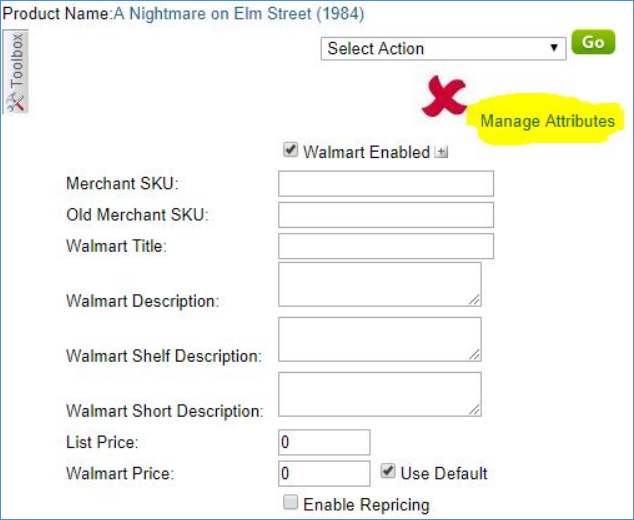 If categories are already selected on products, use the Manage Inventory page's Export Walmart Marketplace Attributes option from the Action Menu to obtain a file with all the correct information, so all you have to do is complete the AttributeName column.